Reports that Facebook employees may have suppressed conservative news stories from the platform’s trending topics section have prompted the chairman of the Senate Commerce Committee to ask the company for answers. News plays a prominent role on Facebook – 63% of Facebook users (or 41% of all U.S. adults) say they get news on the site, according to our 2015 survey. But political partisans differ in how they experience news there. In January, we found that about four-in-ten Americans (37%) had learned about the election in the past week from Facebook. Liberal Democrats (51%) were more likely to say this than both conservative (34%) and moderate or liberal Republicans (33%). 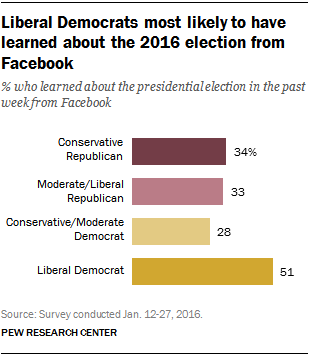 Liberal Democrats were also more likely to have learned from Facebook than conservative or moderate Democrats (28%). More liberal Democrats use Facebook to begin with, which contributes to this partisan split. However, this difference persists among Facebook users. About half of conservative Republican Facebook users (51%) learned about the election on the platform, a smaller share than the 62% of liberal Democratic Facebook users who said the same. Moderate or liberal Republican Facebook users (46%) and conservative or moderate Democratic Facebook users (43%) were also less likely to have learned about the election on the site. And, while younger Americans overall are particularly likely to rely on social media sites – not just Facebook – for election news, it stands out as a particularly common source for one particular group of young people: Millennial Democrats who were engaged in the primaries. Nearly three-in-four Millennial Democrats (74%) who said they were very likely to participate in their state’s primary or caucus had learned about the election from social media in the past week, compared with 50% of their Republican counterparts. A study from 2014 also revealed that conservatives and liberals have different experiences seeing posts about politics on Facebook. About half of Facebook users who express consistently conservative views across a range of political values questions (47%) see posts on the site that align with their views all or most of the time, compared with only about a third (32%) of those who express consistently liberal views. However, a larger share of these consistently liberal Facebook users than of consistent conservatives have de-friended, hidden or blocked someone because of something that friend posted about politics (44%, vs. 31%). Both groups, however, are more likely than those with more mixed political views to report seeing like-minded views and blocking others at much higher rates. Overall, most Facebook users see a mix of views on the platform: Only about a quarter of Facebook users (23%) see views that align with their own all or most of the time. There are other ways in which consistent conservatives and consistent liberals stand out from those with more mixed ideological views. For example, both groups are more likely to pay attention to posts about government and politics on Facebook. Two-thirds (67%) of consistently conservative Facebook users pay some or a lot of attention to these posts, as do six-in-ten consistent liberals. This is true of only 49% of those with mixed ideological views, 46% of those with mostly conservative views and 51% of those with mostly liberal views.